ATTACHMENT AND emotions towards politicians are common in the country like India. But giving up life for their beloved leader is something unprecedented. But South India is known for it. Earlier it was MG Ramchandran, the chief minister of Tamil Nadu – popularly known as MGR and now Chief Minister of Andhra Pradesh Y S Rajasekhar Reddy also called YSR broke all the records. Similarly, many people tried to self immolate and commit suicide when AIADMK leader Jayalalitha was arrested and also during the arrest of DMK supreme M Karunanidhi such reports came to fore. 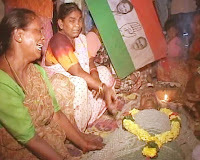 But the aftermath of YSR’s death is something unheard of in any part of the world. One hundred and fifteen people died of cardiac failure and another 26 committed suicide after the chief minister died in a tragic helicopter crash deep in the Nallamala jungle. While 42 people died on the first day (Thursday) soon after news of YSR’s death reached them, the toll went up to 141 on Friday as many could not bear the shock of their leader’s demise. All TV news channels beamed live the funeral procession and last rites, throwing people into a state of what psychologists described as "mass hysteria". Psychiatrists explain the unprecedented number of deaths to the slow build-up of mental trauma and suppression of emotions over a period of 24 to 48 hours. 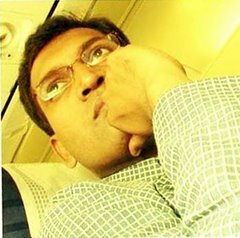 The news of YSR’s helicopter disappearing was flashed on Wednesday afternoon and this caused mental agony and tension to his admirers. This state continued for a full day, heightening the trauma. "People are attracted to leaders not only by their policies and programmes, but also by their personalities, the way they speak, dress and talk to them. This gradually creates a sort of hero worship and, when something tragic happens, they cannot bear the loss. This leads to mass hysteria," said renowned psychiatrist Dr Ella Rao. Se said there would have been mass violence had the news broken suddenly. "Now people are killing themselves. In case the news of death emerged the same day, people would have resorted to violence, killing others. They would have made someone their target of attack and would have taken to the streets." Despite appeals to the people by chief minister K. Rosaiah and YSR’s son, Kadapa MP Y.S. 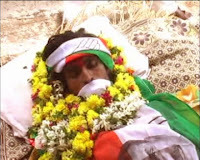 Jagan Mohan Reddy, to not resort to suicide, the death roll kept increasing on Friday. 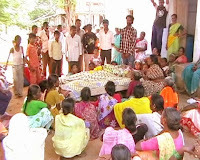 Twenty-three people died due to shock in Warangal district, while in East Godavari 14 people succumbed to shock and two committed suicide. 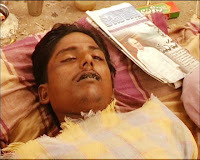 Six people died in Krishna and three in Adilabad. In Narsapuram in West Godavari district, an MRPS activist climbed up a cell tower and threatened to end his life if Mr Jagan Mohan Reddy was not made chief minister. The toll, district-wise, is Nalgonda 11, Medak 11, Mahbubnagar six, Karimnagar eight, West Godavari three, Prakasam six, Nellore and Chittoor seven each, Visakhapatnam five, Vizianagaram and Srikakulam five each, Hyderabad three and Nizamabad seven.